This fantastic video was shot by the husband of one of our students at the 2017 retreat. He had bought with him a drone and on a clear day programmed it to shoot this film. 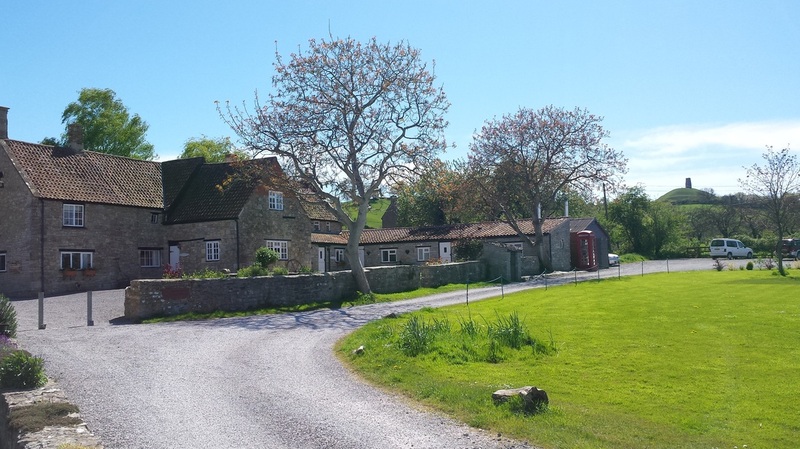 You will be staying at the wonderful and very comfortable Middlewick Farm. Middlewick is in a spectacular location; sitting by the ancient oak trees Gog and Magog which are thought to be the entrance to the ancient Isle of Avalon, and backing onto Glastonbury Tor. 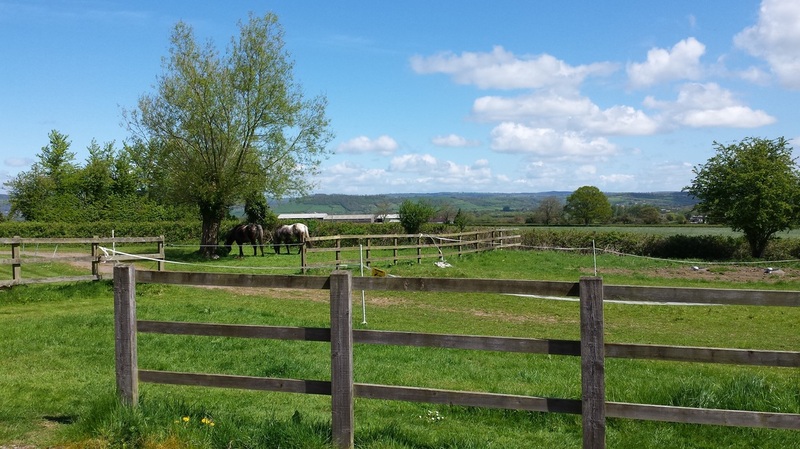 It has unrivaled views across the Somerset levels to Cheddar George and the Mendip Hills. It is a peaceful and tranquil location in an area steeped in history, myth and legend. 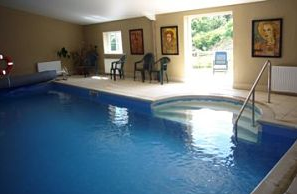 Nestled in a sixteen acre blend of gardens, horse paddocks and orchard, Middlewick is a wonderful place to relax, with the added bonus of a heated indoor swimming pool and steam room which you can access between 8am -8pm, click the link for more information. Middlewick is the perfect place for us to run our retreat, beautiful, peaceful and spacious it provides everything we need to make your stay inspiring and relaxing. You will have accommodation for 6 nights, each cottage has a range of different rooms including singles, doubles and twins and will be on a first come first serve basis. Once you have selected the room you would like to book please get in touch with the deposit to secure that room. The cost of the room on the prices page is the full price you will pay for the full package there are no extra costs other than alcoholic drinks and sterling wire if you wish to work in sterling. The aim of the week is to give you a break from everyday life and for you to indulge your passion. the week is intensive although we will make time for relaxing and socialising at the end of the day. Although this is meant as an independent retreat for individuals we recognise that people may want to bring their other half, husband, wife, partner etc who may not be interested in joining the workshop but wants to enjoy the location and hospitality. This is fine as most of the rooms are doubles or twins there is plenty of space what we ask is for a Non-participating Supplement to cover extra costs and food. This will be £60 per night and this will be only available for those sharing a room. The supplement will cover breakfast and dinner but not lunch as this will interfere with the days workshop but as all the cottages have a kitchen and living rooms other halves will be able to fend for themselves for lunch, also Glastonbury town has a wonderful selection of coffee shops, restaurants and shops where lunch can be bought and there is also a well stocked farm shop on site so they won't starve! All rooms are booked on a single occupancy regardless of whether they are single, double or twin. We felt that sharing rooms with strangers would detract from the overall feel of the retreat but that doesn't mean that we discourage friends from attending together. If you are not going to have your partner in tow, maybe you are 2 wire wrapping enthusiastic friends then you may wish to share a twin or may be you are a couple who would like to do the week together then we have a double occupancy option on some of the cottage/ rooms to cover food and course costs, materials etc. So you can share the cost of the room. This means that 2 people will be fully attending the week but sharing 1 room. We hope this is clear, we don't want people to feel that they can't come with someone if need be and there are 2 options to allow this depending on your situation. It is not compulsory to share or to bring anyone this is meant as a personal retreat for an individual to indulge themselves and their passion, these options are just here for those who do. If you would like anymore information about the accommodation, sharing, not sharing, booking or anything else then please email Tabatha to ask or discuss anything about the retreat. Or get in touch using the contact form at the bottom of the page. Click here to be taken to the prices and cottages page. 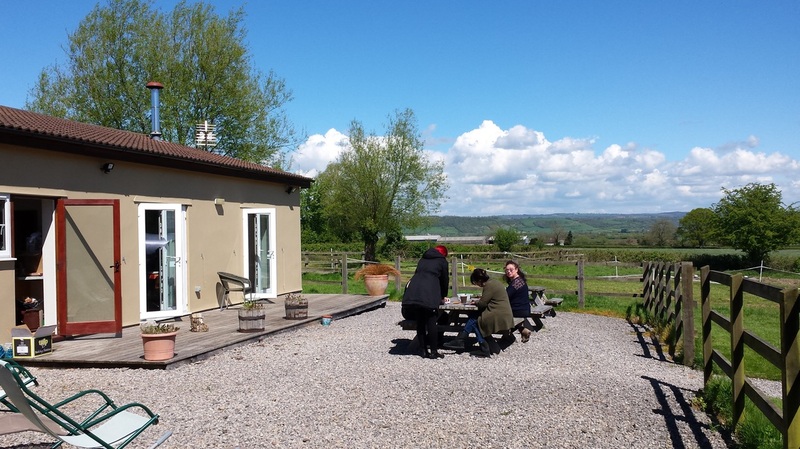 We at Glastonbury Wire Studio love our food and want to provide you with plenty of lovely food to indulge in and sustain you throughout your stay. We have a fabulous caterer Keren from Events Horizon, she takes great care of us all each year. Keren managed to keep everyone extremely well fed, her fabulous handmade scotch eggs and chocolate brownies are the stuff of legend. She created some delicious food for the evenings with even vegan, veggies, gluten frees and full blown carnivores well taken care of. All your meals, soft drinks, tea and coffee, afternoon tea and cake is included in the price. The first night we will provide a meet and greet buffet and a few drinks. Then each morning you will be able to start your day with a beautiful continental breakfast with pastries, muffins, toast, jam and marmalade. Also fresh fruit, muesli and yogurt. 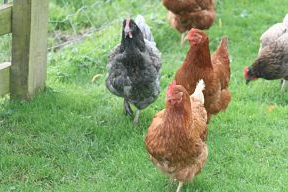 And just because this is a special week and you will be working hard there will be fabulous bacon rolls available too. Lunch will be a buffet of sandwiches, wraps, quiches, crisps, and salads. This will be taken as a working lunch although you will need time to get a break and stretch legs and eyes! Followed most importantly by some of the most wonderful cakes to keep you going through the afternoon. Dinner will be a delicious hot meal followed by pudding served in the function room at 6:30pm with plenty of time to chat and relax. After which you can retire you your cottage, take a walk or hang out in the function room. Most students continue to work late into the night with the tutors. Keren, our chef, is not only a fantastic cook she is also very flexible at catering for all dietary requirements and allergies. All the food is prepared on site and Keren is on hand if any special requirements are needed. The decision was made to not include alcohol in the price of the retreat as not everyone drinks. You are very welcome to bring your own or there is a shop in site selling wine, beer and cider. Plenty of teas, coffee, fruit juice and spring water will be available all day in the function room. We aim to provide all the necessary tools and materials for your work at the retreat, we have soldering stations, polishing stations and full bags of tools for each person to use during their stay at the retreat. You do not need to bring anything with you although you are welcome to. All consumables such as wire, solder paste, beads, cabochons etc are provided so that you can complete the work set. Copper wire is provided on the reel so there is always plenty, but silver is a little more tricky. ​When working in fine and sterling silve will be provided for this Retreat enough to complete your projects and make a 'few' mistakes. More will be available to buy should you require any additional wire.